While I’m taking a blogging break, I’m hoping to host some guest writers. Today, Jules Middleton takes the reigns. Jules works for a church in West Sussex and can be found on Twitter posting as @redjules. She blogs at Apples of Gold. Please do go and have a peek at what she’s up to. 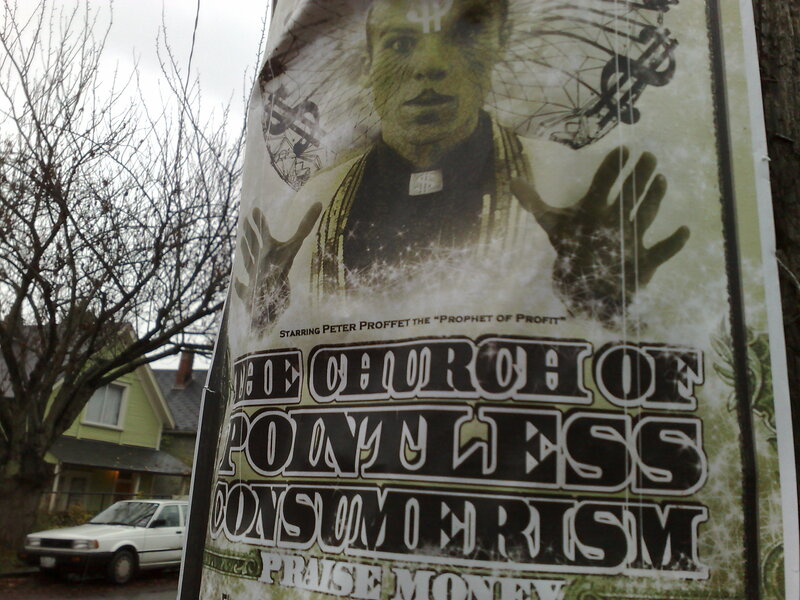 ‘Consumer Church’ seems to be a bit of a buzz phrase in Christian circles at the moment and not in a positive way. So what on earth is it and is it really all that bad? Well, in simple terms it means that people treat church like any other area of their life – as consumers. I rather like definition No.1 above, but can we as the church, be seen to be protecting or promoting the interests of our consumers? or are we, like everyone else, more on No.2: preoccupied with the acquisition of consumer goods, or more like the acquisition of consumers as far as the church is concerned! Let’s face it, we live in a consumer-led age. Much of what we see or encounter daily, is designed to feed our ‘inner consumer’. Our culture teaches us that we need ‘stuff’ and there’s no avoiding it. Modern marketing is so clever isn’t it? It’s gone way beyond TV ads appealing to our personal desires, you know: ‘you can be the perfect Mum if you buy this brand of nappy’, or ‘you will be the best date if you buy our brand of aftershave’. Ever noticed how ads on Facebook & other sites pop up related to a website you have just looked at? spooky, huh? Not really, it’s just very clever marketing. Of course, it’s not only ‘stuff’ that we consume. We consume information at a rate faster than any generation has experienced before. At the click of a button, we can find out pretty much anything we want. We can communicate with people in the remotest areas of the world just with a few simple taps on our phones. Our lives revolve around what we need, what we can get and when we can get it. Sounds a bit negative maybe? Well just ask yourself, how often do you buy online rather than going to the local shop? How often do you get frustrated that you can’t get an appointment at the doctors as soon as you’d like? How often do you get annoyed with being on hold for more than 20 seconds, or when you don’t get an instant reply to a text or email? My first job was the glamorous world (not) of Superdrug on a Saturday. The manager told me on my first day ‘the customer is always right, even when they’re not’. This has really stuck with me, but recently I’ve begun to wonder if we, as a society, haven’t taken that to the absolute extreme. We have created a world that we expect to serve us, and not only that but we want to be served and we have got used to it. So then, why should we be surprised when people take the same attitude to church? As church leaders we find it frustrating when people don’t ‘join in’, when they regularly attend without giving anything back. But in a way we have made a rod for own backs, as the more contemporary forms of church have developed, so have people’s desires for different ways of doing church. Many have become disgruntled with their local church and have searched out more – because they can, and, because that’s what society teaches them to do. Just as once, people might have complained about the local grocers not having the brand of pickle they prefer and instead driving to the big supermarket out of town, now, we have arrived at consumer church. We go where we feel we fit, where we feel we get what we need, where we can choose the brand of Gospel that we prefer. Because, we can. So what are we all complaining about? If people are consumers, what’s the problem? Clearly, the message Jesus brought was about being the server, not the servee and if we go through life expecting things put on a plate for us then we are not giving a great example of who Jesus was, are we? But I would suggest that the fact is we do live in a consumer age so how can we make that work for us as the church? It’s a tough call to get people to walk against an existing and all encompassing way of life, so what can we do to embrace consumerism in a Godly way? Well if you think about it, don’t we want people to ‘consume’ God’s word? Don’t we want people to take on board what we are preaching? Don’t we want to bless people with the services we put on? Many of the more successful churches are those that embrace consumerism and work it, for example using podcasts and video clips circulated online, so people can access them as and when they need; social media is used as a way of getting information out to people at their convenience; online communities, chatrooms and even interactive web-based church services make a place that is accessible to all; prayer rooms that are open 24/7 means people can find a place of worship to attend at any hour of the day or night; God TV and other channels provide all manner of teaching, worship and prayer at the click of a button, when we want it. So I ask you to consider, in this era of one-click-consumption, is consumer culture in the church all bad? or should we be making it work for us? It is an ongoing issue in the church and one that is not likely to go away any time soon, so it’s about time we started thinking about it! If anyone else would like to guest post here, do drop me a line.